The new Michelin Power RS has a big gap to fill, as it is intended to replace both the Super Sport EVO and Pilot Power 3. Blending the hot dry performance of the Super Sport EVO, with the on-road comfort and wet grip of the Pilot Power 3 was always going to be a tricky task, but Michelin are confident they've succeeded. So confident in fact, that they've invited Tyre Reviews to Losail International Moto GP circuit in Qatar to test the new tyres on the latest range of super bikes. The headline stats look super impressive. 3.5 seconds faster in the dry at the 2.6km Circuito de Cartagena, and "up to" 3 seconds a lap faster in the wet when compared to the outgoing Pilot Power 3. The new tyre was developed and tested over three continents covering five different circuits, and 15 prototypes were tested on 54 different motorcycles over the two year development cycle. Given the Power RS is a sports bike tyre and not a track tyre, all that extra pace would be useless if it came at the expense of stability and agility, which is why the two qualities were as much a focus of the RS development as raw pace. Michelin spend 700 million euros per year on R&D, and while the new compounds account for most of the speed increase, there's plenty of new technology to improve the other areas of the tyre. The rear tyre is fitted with the brand new ACT+ technology which is key for the improvement in stability and handling. Michelin started working on this new technology nearly 4 years ago, and are calling it "probably one of the most significant motorcycle tyre innovations since the invention of the radial in 1987". Michelin have also optimised the dual compound split (2CT+) on the front and rear tyres, changing the rear to a 23/54/23 split and the front to 16/68/16, and worked on the internal profile of the tyre, changing the thickness of the tyre to optimise the steering precision at various steering angles. While all the technical information tells the story in data, riding ensures the new tyre performs as promised. Testing with a pair of BMW S1000RRs, we had the opportunity to test the new Power RS back to back with the outgoing Pilot Power 3. Initially the Pilot Power 3 felt like a good tyre. Stable on the straight, and a nice turning with perhaps just a little instability on corner entry while trailing the brakes, and corner exit on the throttle, but the combination of Losail circuit and a litre superbike was always going to push a road tyre to its maximum. There was noticeable traction control on the mid speed corner exits too, with the flex in the tyre at certain lean angle causing the bike to move as power was cut. Switching to the Power RS immediately showed the new tyres qualities. The bike felt instantly more stable, dropping into turn one with a beautiful predictable turn. As the speed picked up, so did the differences in the two tyres. Where the Pilot Power 3 felt a little soft when trailing the brakes, and unstable on throttle application, the Power RS was unfazed by similar inputs. Likewise, when the traction control intervened, it was less of an event, with the tyre seemingly working better with the computers. While the laps weren't timed, the new Power RS definitely gave you more confidence in how the bike would react, and the ability to extract more performance from the tyre without any moments. The new tyre isn't just for the extreme end of the super touring segment. It's intended for all kinds of bikes, which Michelin chose to highlight by putting us on a 300cc R3 in the car park. 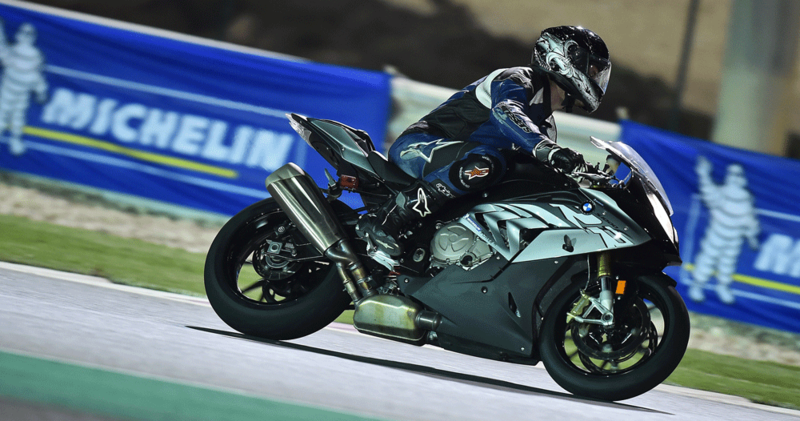 Riding around a scaled down Losail track, the smaller version of the tyre performed admirably, with the bikes quick to turn, as stable as their big brothers, and under a full ABS wet braking test, proving to have incredible levels of grip. During all this extreme track riding it would be easy to forget that this is a sports bike tyre. Five years ago, a tyre which worked this well on track, and took this much abuse without overheating and falling apart would be useless on a cold, wet road, but Michelin assure us that the Power RS is every bit the improvement on road as it is on track, and has a 45c operating window. Michelin started the event promising that the Power RS was a segment changing tyre, and the evidence so far looks to confirm that statement. As always, keep an eye on the independent magazine tests for validation, but if another tyre can challenge this tyres performance in 2017, we'll be surprised. The Power RS is available immediately in 13 launch sizes covering a large percentage of the sports bike market. Published at April 6th, 2017, 2:53 pm, by Jonathan Benson.